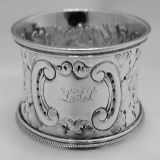 American coin silver napkin ring c. 1880. This beautiful napkin ring has embossed applied rims and nicely detailed engraved birds around the body, the ring is monogrammed MK. Dimensions: 1 3/4" - 1 5/8", weight 25 grams or 0.8 ozs troy. The excellent original condition and clear, crisp detail, with no removals, repairs or alterations, make this an especially attractive offering. Monogrammed as described above, the soft, warm, original antique finish is present, with no buffing or machine polishing. 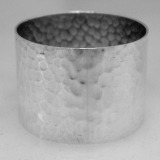 English sterling silver hammered napkin ring by Edward Viner Sheffield date marked for 1932. Dimensions: 1 3/4" - 1 1/8", weight 31 grams or 1 ozs Troy. The excellent original condition and clear, crisp detail, with no monograms, removals, repairs or alterations, make this an especially attractive offering. The soft, warm, original antique finish is present, with no buffing or machine polishing. 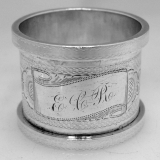 American coin silver engine turned napkin ring, inscribed E Overton MacFarlane, c. 188o. Dimensions: 1 7/8" - 1 1/8", weight 18 grams or 0.6 ozs Troy. The excellent original condition and clear, crisp detail, with no removals, repairs or alterations, make this an especially attractive offering. Monogrammed as described above, the soft, warm, original antique finish is present, with no buffing or machine polishing. American coin silver engine turned napkin ring, monogrammed ECR. Dimensions: 1 7/8" - 1 1/2", weight 61 grams 2 ozs Troy. The excellent original condition and clear, crisp detail, with no removals, repairs or alterations, make this an especially attractive offering. Monogrammed as described above, the soft, warm, original antique finish is present, with no buffing or machine polishing. American sterling silver napkin ring by Currier & Roby c. 1940. 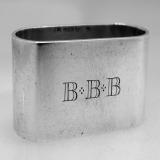 This large and heavy oval napkin ring is monogrammed BBB. Dimensions: 2 1/4" - 15/16" - 1" weight 54 grams or 1.7 ozs Troy. The excellent original condition and clear, crisp detail, with no removals, repairs or alterations, make this an especially attractive offering. Monogrammed as described above, the soft, warm, original antique finish is present, with no buffing or machine polishing. 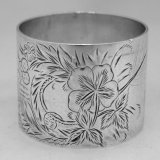 American sterling silver napkin ring c. 1900. 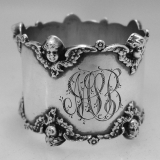 This darling napkin ring has 5 applied cherubs on each border and is monogrammed MSB. Dimensions: 1 3/4" - 1 1/4", weight 24 grams or 0.8 ozs Troy. The excellent original condition and clear, crisp detail, with no removals, repairs or alterations, make this an especially attractive offering. Monogrammed as described above, the soft, warm, original antique finish is present, with no buffing or machine polishing. 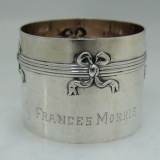 German 800 Standard silver napkin ring, inscribed Frances Morris, c. 1900. Dimensions: 1 7/8" - 1 3/8", weight 38 grams or 1.2 ozs Troy. The excellent original condition and clear, crisp detail, with no removals, repairs or alterations, make this an especially attractive offering. Monogrammed as described above, the soft, warm, original antique finish is present, with no buffing or machine polishing. 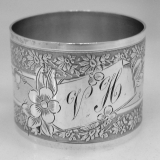 American coin silver napkin ring, monogrammed VAM, c. 1880. Dimensions: 1 7/8" - 1 3/4", weight 25 grams or 0.8 ozs Troy. The excellent original condition and clear, crisp detail, with no removals, repairs or alterations, make this an especially attractive offering. Monogrammed as described above, the soft, warm, original antique finish is present, with no buffing or machine polishing. 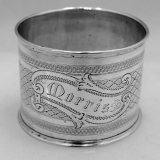 American coin silver napkin ring with reeded and engraved borders by Duhme & Co. c. 1875. Dimensions: 1 5/8" - 1 5/8", weight 21 grams or 0.7 ozs Troy. The excellent original condition and clear, crisp detail, with no monograms, removals, repairs or alterations, make this an especially attractive offering. The soft, warm, original antique finish is present, with no buffing or machine polishing. 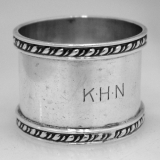 American sterling silver napkin ring with applied gadroon borders by Currier & Roby c. 1930 monogrammed KHN. Dimensions: 1 7/8" - 1 1/4", weight 39 grams or 1.3 ozs Troy. The excellent original condition and clear, crisp detail, with no removals, repairs or alterations, make this an especially attractive offering. Monogrammed as described above, the soft, warm, original antique finish is present, with no buffing or machine polishing. 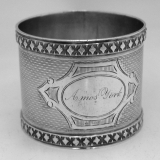 American coin silver engine turned napkin ring c. 1875, monogrammed Amos York. Dimensions: 1 3/4" - 1 1/2", weight 26 grams or 0.8 ozs Troy. The excellent original condition and clear, crisp detail, with no removals, repairs or alterations, make this an especially attractive offering. Monogrammed as described above, the soft, warm, original antique finish is present, with no buffing or machine polishing. 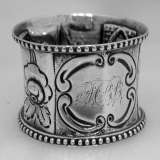 American coin silver napkin ring with applied beaded rims and floral repousse decorations around the body monogrammed MBB, c. 1875. Dimensions: 2" - 1 1/4", weight 19 grams or 0.6 ozs Troy. The excellent original condition and clear, crisp detail, with no removals, repairs or alterations, make this an especially attractive offering. Monogrammed as described above, the soft, warm, original antique finish is present, with no buffing or machine polishing. 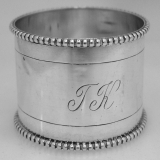 Dutch 833 Continental silver napkin ring with applied beaded borders, monogrammed TK, c. 1910. Dimensions: 2 1/4" - 1 3/8", weight 39 grams or 1.3 ozs Troy. The excellent original condition and clear, crisp detail, with no removals, repairs or alterations, make this an especially attractive offering. Monogrammed as described above, the soft, warm, original antique finish is present, with no buffing or machine polishing. 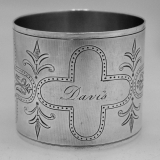 American coin silver engine turned and engraved napkin ring c. 1890, monogrammed Davis V Dain. Dimensions: 1 7/8" - 1 3/4", weight 48 grams or 1.5 ozs Troy. The excellent original condition and clear, crisp detail, with no removals, repairs or alterations, make this an especially attractive offering. Monogrammed as described above, the soft, warm, original antique finish is present, with no buffing or machine polishing. American coin silver napkin ring by Gorham Silversmiths, c. 1865. 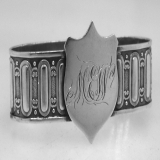 This unusual napkin ring has an applied union shield cartouche, monogrammed MEW. Dimensions: 2 3/8" - 7/8" - 3/4", weight 28 grams or 0.9 ozs Troy. The excellent original condition and clear, crisp detail, with no removals, repairs or alterations, make this an especially attractive offering. Monogrammed as described above, the soft, warm, original antique finish is present, with no buffing or machine polishing. We have two of these available. The price is for one. 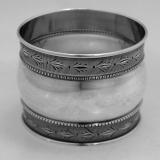 French sterling silver napkin ring by Challes Victor Alexander 1909. This phenomenal napkin ring has engine turned floral decorations and is monogrammed in an ornate period script VH. Dimensions: 2" - 1 5/8", weight 43 grams or 1.4 ozs Troy. The excellent original condition and clear, crisp detail, with no removals, repairs or alterations, make this an especially attractive offering. Monogrammed as described above, the soft, warm, original antique finish is present, with no buffing or machine polishing. American coin silver engine turned napkin ring with applied beaded borders, monogrammed SDG. Dimensions: 1 3/4" - 1 1/4", weight 29 grams or 0.9 ozs Troy. The excellent original condition and clear, crisp detail, with no removals, repairs or alterations, make this an especially attractive offering. Monogrammed as described above, the soft, warm, original antique finish is present, with no buffing or machine polishing. 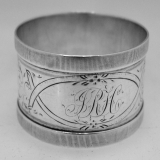 American coin silver napkin ring with applied borders, monogrammed Mother to Genie. Dimensions: 1 7/8" - 1 1/4", weight 19 grams or 0.6 ozs Troy. The excellent original condition and clear, crisp detail, with no removals, repairs or alterations, make this an especially attractive offering. Monogrammed as described above, the soft, warm, original antique finish is present, with no buffing or machine polishing. American coin silver napkin ring by Wood & Hughes c.1875. 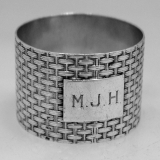 This attractive napkin ring has a heavily embossed allover basket weave design with an applied rectangular engraved border cartouche containing an monogram MJH. Dimensions: 1 5/8" - 1" weight 26 grams or 0.8 ozs Troy. The excellent original condition and clear, crisp detail, with no removals, repairs or alterations, make this an especially attractive offering. Monogrammed as described above, the soft, warm, original antique finish is present, with no buffing or machine polishing. 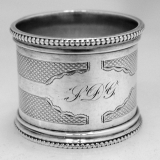 American coin silver napkin ring with reeded borders, monogrammed IRH, c. 1880. Dimensions: 1 5/8" - 1", weight 20 grams or 0.6 ozs Troy. The excellent original condition and clear, crisp detail, with no removals, repairs or alterations, make this an especially attractive offering. Monogrammed as described above, the soft, warm, original antique finish is present, with no buffing or machine polishing. 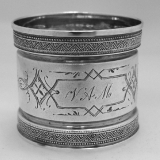 American sterling silver napkin ring by Gorham Silversmiths, date marked for 1879, monogrammed LQ. Dimensions: 1 7/8" - 1 1/2", weight 23 grams or 0.7 ozs Troy. The excellent original condition and clear, crisp detail, with no removals, repairs or alterations, make this an especially attractive offering. Monogrammed as described above, the soft, warm, original antique finish is present, with no buffing or machine polishing. 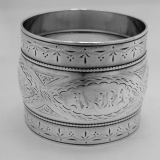 American coin silver napkin ring with a tapered floral repousse body having applied reeded borders, monogrammed in an ornate period script LAS. Unmarked, but guaranteed to be as represented. Dimensions: 2 1/8" - 1 1/4", weight 27 grams or 0.9 ozs Troy. The original condition and clear detail, with no removals, repairs or alterations, make this an especially attractive offering. Monogrammed as described above, the soft, warm, original antique finish is present, with no buffing or machine polishing. 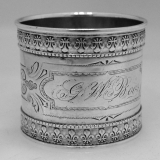 American coin silver napkin ring, inscribed G W Boos, c. 1880. Dimensions: 1 3/4" - 1 3/4", weight 35 grams or 1.1 ozs Troy. The excellent original condition and clear, crisp detail, with no removals, repairs or alterations, make this an especially attractive offering. Monogrammed as described above, the soft, warm, original antique finish is present, with no buffing or machine polishing. American coin silver napkin ring c. 1880. This beautiful napkin ring has engine turned decorations on the body, inscribed Morris. Dimensions: 2" - 1 5/8", weight 20 grams or 0.6 ozs Troy. The excellent original condition and clear, crisp detail, with no removals, repairs or alterations, make this an especially attractive offering. Monogrammed as described above, the soft, warm, original antique finish is present, with no buffing or machine polishing. 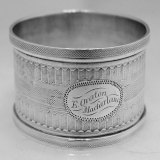 American sterling silver napkin ring by Blackington c. 1910. 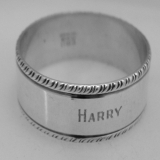 This napkin ring is inscribed Harry and measures 2" - 3/4" and weighs 52 grams 1.7 ozs Troy. The excellent original condition and clear, crisp detail, with no removals, repairs or alterations, make this an especially attractive offering. Monogrammed as described above, the soft, warm, original antique finish is present, with no buffing or machine polishing. 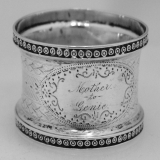 American coin silver napkin ring c. 1860. This beautiful napkin ring has reeded borders and is monogrammed in an ornate period script MAW and inscribed Ed from Helen. Dimensions: 2" - 1 3/4" weight 41 grams or 1.3 ozs Troy. The excellent original condition and clear, crisp detail, with no removals, repairs or alterations, make this an especially attractive offering. Monogrammed as described above, the soft, warm, original antique finish is present, with no buffing or machine polishing. 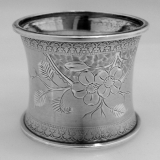 German 800 Standard silver napkin ring c. 1900. This very unusual napkin ring has allover embossed floral decorations and applied Union shield, the inside of the ring is gilt. Dimensions: 2" - 1 1/8", weight 30 grams or 1 ozs Troy. The excellent original condition and clear, crisp detail, with no monograms, removals, repairs or alterations, make this an especially attractive offering. The soft, warm, original antique finish is present, with no buffing or machine polishing. 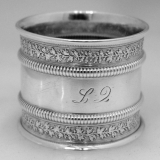 American coin silver napkin ring c. 1870. This beautiful napkin ring has embossed grape borders and is monogrammed MFM. Dimensions: 2" - 1 3/4", weight 31 grams or 1 ozs Troy. The original condition with no removals, repairs or alterations, make this an especially attractive offering. Monogrammed as described above, the soft, warm, original finish is present.